Lansdale Catholic’s Sarah Fitzpatrick (right) battles for the ball with Archbishop Ryan’s Keri Gontz in the Catholic League championship. The Radnor boys' soccer team faced adversity over the past few weeks and beat it. After falling to Spring-Ford in the quarterfinals of the PIAA District 1 Class 4A tournament, the Raiders secured a spot in the state playoffs with a 1-0 win over North Penn in the fifth-place game. On Saturday, the Raiders (18-3-2) will try to keep the roll going as they take on District 6 champion State College in the quarterfinals at 3 p.m. at Cedar Crest High School in Lebanon. State College is coming off a 2-1 overtime victory over Norwin. The Little Lions, who made the state quarterfinals for the first time since 2011, are led by senior forward Daniel Bennett and midfielders Marc Rodgers, Garrett Callenberger and Ben Vollmer. In other 4A boys' action on Saturday, Abington (21-2) takes on Seneca Valley at 3 p.m. at Chambersburg High School, and Unionville (17-6-1) plays Central Dauphin at 4 p.m. at Manheim Township High School in Lancaster. Holy Ghost Prep and District 12 champion Archbishop Wood will do battle in Class 3A at noon at Central Bucks East, and District 1 champion Strath Haven will face Athens at 3 p.m. at Hazleton. In Class A, Faith Christian is set to play Camp Hill at 3 p.m. at Tulpehocken High School in Bernville. Lansdale Catholic's season already includes a District 12 Class 2A crown and the program's first Catholic League title. The Crusaders' run started when Sarah Fitzpatrick scored in overtime for a 1-0 decision over Archbishop Ryan in the Catholic League final. 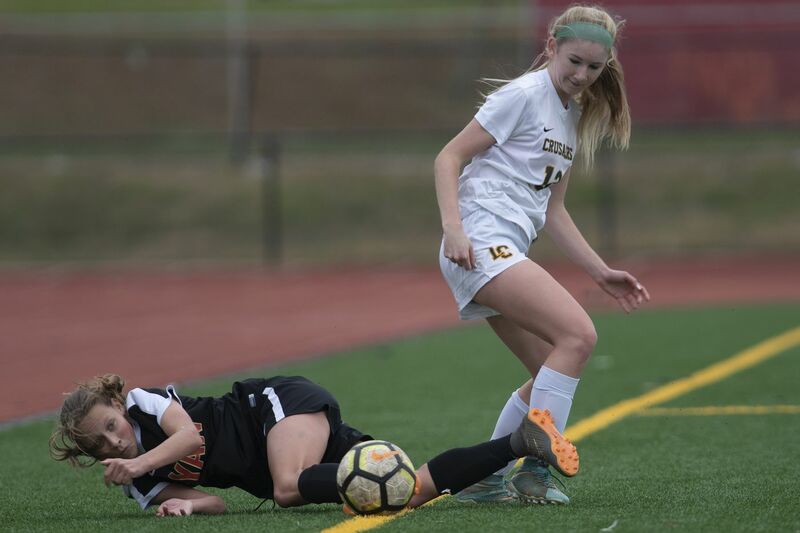 A few days later, Emily Schall scored in double overtime to give Lansdale Catholic a 1-0 win over Masterman in the District 12 championship game. On Tuesday, Kellie Gillen scored a goal in the second half as Lansdale Catholic sneaked past St. Basil, 1-0, in the first round of states. All that led to the Crusaders playing Lewisburg at 2 p.m. on Saturday at at Manheim Township. Lewisburg advanced to the quarterfinals by defeating Eastern Lebanon County High School on penalty kicks. Cassia Kiepke, Chloe Michaels, Allie Reed and Ella Reish all made their penalty kicks to give the Green Dragons the win. Saturday's Class 4A play has Penncrest meeting Ephrata at 11 a.m. at Upper Perkiomem, Pennridge taking on Parkland at 1 p.m. at Upper Perkiomen, and Souderton taking on Seneca Valley at 1 p.m. at Chambersburg. In Class 3A, Villa Joseph Marie will play Scranton Prep at 1 p.m. at Whitehall, and Archbishop Ryan faces Mechanicsburg at 1 p.m. at Tulpehocken. Led by star Hannah Miller, Villa Maria started its state Class 2A title defense with a 9-0 rout of Berks Catholic. Miller, who has more than 40 goals for the second straight season, recorded a hat trick on Tuesday. The Hurricanes, who claimed their second straight District 1 title, beat Wyoming Valley West in last year's state championship. Villa Maria will take on Palmyra in the quarterfinals at noon Saturday at Twin Valley. District 12 champion Archbishop Carroll will play Donegal at 2 p.m. at Twin Valley. Exeter Township will host a triple-header in Class 3A. Central Bucks East will take on Emmaus at noon, Perkiomen Valley will face Wilson-West Lawn at 2 p.m., and Methacton will do battle with Lower Dauphin at 4 p.m. In Class 1 A action, Sacred Heart plays Greenwood at 11 a.m. at Manheim Township, and New Hope-Solebury takes on Oley Valley at 11 at Whitehall. Bishop Shanahan has its sights set on a Class 4A state title after falling just short a season ago. The Eagles lost to North Allegheny in last year's championship match. Coming off its fourth straight District 1 title, Bishop Shanahan opened states with a 3-1 triumph over Hempfield. The Eagles will play Ches-Mont League foe Downingtown West at 6:30 p.m. on Saturday at Upper Dublin. Shanahan is already 2-0 against Downingtown West this year, including a win in the district semifinals. Also at Upper Dublin, Upper Merion will play District 11 champion Parkland at 5 p.m. Garnet Valley will face Cumberland Valley at 6 p.m. at Exeter Township. In Class 3A action, Villa Maria takes on Allentown Central Catholic at 2:30 p.m. at Quakertown, and Pope John Paul II plays against West York at 3 p.m. at Governor Mifflin. Also at Quakertown, New Hope-Solebury will do battle with Holy Redeemer at 1 p.m. in a Class 2A quarterfinal.